Hideo Kojima's Metal Gear Solid series of video games has a reputation for cinematic storytelling. It also has a reputation for storytelling through really long cutscenes (those videos before and after the action). I actually sat down and played the series and timed how long the cutscenes were, so we can finally separate fiction from fact. For this, I played Metal Gear Solid 4 and the Metal Gear Solid HD Collection. I chose these games because MGS4 is the latest numbered entry in the series, and the games on the HD Collection (MGS2, MGS3 and Peace Walker) are available on PS3, XBox 360, PSP, PS Vita and 3DS. This way, if you want to play the games yourself and/or check my math, it won't be too hard to track them down. These games are all available without connecting to an online storefront as well, which is partially why I left out MGS1. These are also the games most relevant to our current console generation, which is why I left out the original Metal Gear Solid, The Twin Snakes remake on Gamecube, and Portable Ops on PSP. The point of this article is to assign a definite length to MGS's cutscenes, so you can take that info and compare it to other games. I don't see a point in comparing a Gamecube or PSP exclusive to a current gen game like Gears of War or Assassin's Creed. The Ac!d series isn't canonical, and the MSX originals (Metal Gear and Metal Gear 2) don't really have cutscenes, so they're left out. What defined a cutscene; I decided if it was longer than 30 seconds, and control was taken away from the player, it was a cutscene. This means the 15 second codec calls about pushing the Action Button didn't count, and the torture scene in MGS2 wasn't a cutscene, while the torture scene in MGS3 was. Basically if it had a fail state, it wasn't a cutscene. These results are based on my results of an average playthrough of these games. I can't claim to have seen and timed every cutscene in all four games (it would probably take someone comparable to Kojima himself at Konami, the series' publisher, for that), but for the average playthrough, these are the scenes you would have seen. I should point out that just about all the longest cutscenes in these games come at the very end; Kojima apparently decided to "save the best for last" and hit players with the most story at the end. 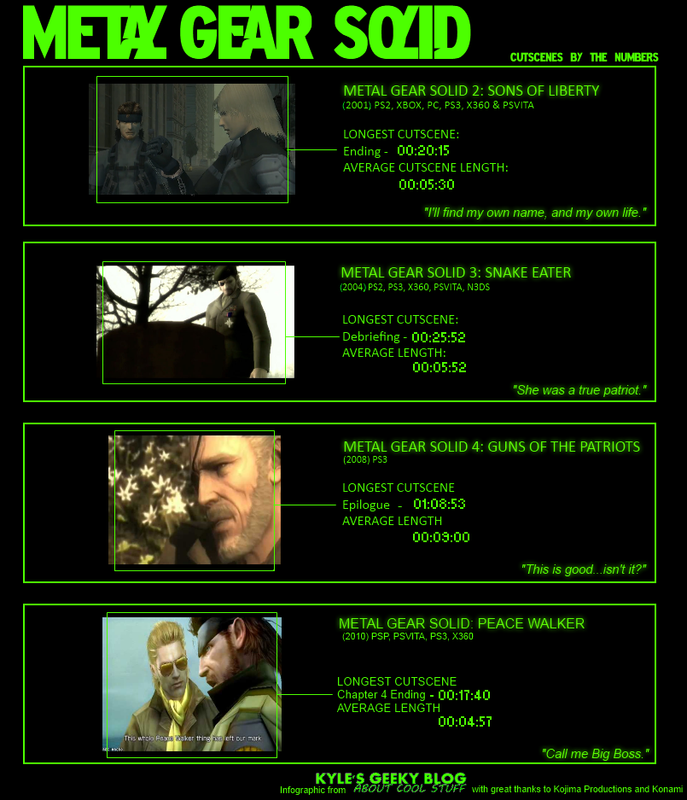 Also, contrary to internet myth, MGS4 does NOT have 90-minute cutscenes. The final and longest one, Epilogue, hits at a little over an hour, which is wrapping up a series of video games seven installments deep at that point, so it's understandable. After all, how long as the finale of Lost or another of your favorite long-running shows? So with that we have a slightly better understanding of how long we can expect to be watching Snake and Co. on their adventures before we get to sneak around some more. Metal Gear Rising: Revengeance is coming out later this year, so let me know in the Comments if I should do this again with that game and the remaining titles. Um. Looks like the picture and quote you chose for MGS3 could have used a spoiler alert. Anyway, very nice to get some clarity on how long the cutscenes actually are, outside of the hyperbole on forums and such.